University of Nottingham > Blogs > History Past and Present > Uncategorized > Were the Waldensians Heretics? In 1214 Peter of les Vaux-de-Cernay, chronicler of the Albigensian Crusade (1209-29), stated that after taking the town of Morlhon, south of Rodez, “we found seven heretics of the Waldensians sect; they were at once led to the legate and confessed their unbelief freely and fully. The crusaders seized them and burnt them with great rejoicing.” But were the Waldensians always regarded as heretics? And what was the relationship between the Cathar heresy in in southern France and the Waldensian movement? Were they complementary or antagonistic? The Waldensian sect was founded in the 1170s by a merchant of Lyon named Valdes. He and his followers renounced property and embraced the poverty of the Apostles, following Christ’s command to preach the word, and relied on lay charity for sustenance. Embracing poverty was not heretical, but it was illegal to preach without episcopal permission. However this did not stop the Waldensians and although their poverty and chastity was praised by the Third Lateran Council of 1179, they were discouraged from further preaching. Their emphasis on poverty and preaching has usually been seen by historians as a threat to the moral authority of the Church. The Waldensians were excommunicated in 1182 and anathematized along with other heresies by Pope Lucius III in 1184, thereby legitimating punishments such as burning (as recalled by 17th-century British Protestants, top right). At this point, we might say, the Waldensians officially became heretics. In a new article (see link) Claire Taylor argues that the history of the sect before and during the Albigensian Crusade, which was unleashed against heresy in southern France, remains largely unwritten. In fact there was a period before the Crusade, when the Waldensians were widely tolerated. This was located ‘quadraginta anni’ or ‘forty years’ before the inquisitions of the 1240s in the minds of witnesses interrogated at that point. This was a common way of referring to the period before the Crusade began. Furthermore, although some historians have doubted the real existence of a dualist Cathar heresy, dismissing it as the creation of secular authorities eager to extend their power (see Blog 17 July 2013 blogs.nottingham.ac.uk/historypastandpresent/2013/07/17/the-cathar-heresy-fact-or-fiction/) Taylor argues that the Waldensians actually came to Languedoc in order to confront Cathar dualism and that is why they were tolerated in a de facto sense in the 1180s and 90s. The Waldensian writer Duran of Huesca’s Liber antiheresis (1180s), for instance, defends the sacraments against dualism. The belief system he attacks – which he called ‘Cathar’ – included rejection of the material world and belief in its creation by an evil god, both typically Cathar. Therefore although some accounts from the period describe both Waldensians and Cathars as heretics, the former was fundamentally different from the latter. 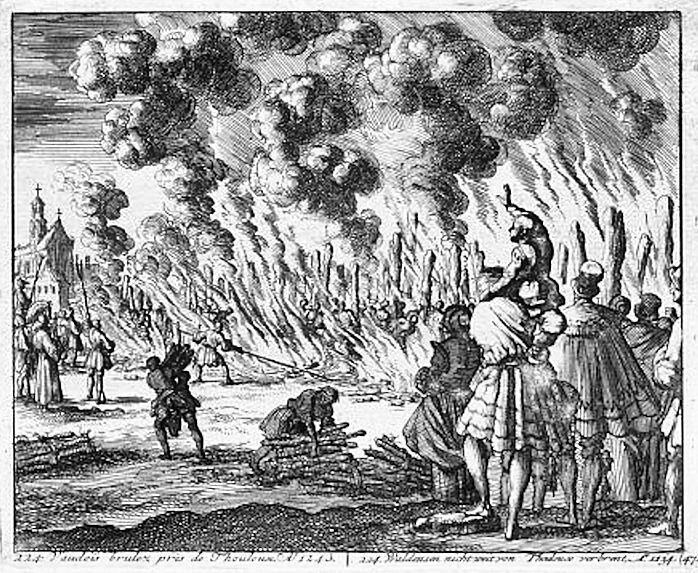 Right from the start, Waldensians were in fact “both allies and enemies of the clergy” in southern France as the inquisitions of the 1240s demonstrated. The Waldensians tried to avoid the worst of the Fourth Crusade and its aftermath not by going underground, but by moving outwards from Languedoc, as the incident at Morlhon suggests. However, they were ultimately destroyed as heretics along with the Cathars they had tried to stigmatize in the same way. This blog showcases research in the Department of History, setting out key points and arguments and highlighting the relevance of historical events in today’s society.